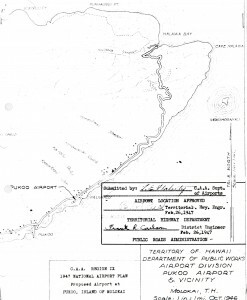 In 1947, the Territorial Superintendent of Public Works proposed constructing a Class I airport at Pukoo, Molokai. The airport would be located at the easternmost point of Molokai where it could be economically constructed at the most favorable normal line of flight location to serve as an emergency airstrip for aircraft flying from Molokai Airport to Maui by either the northerly or the southerly lines of travel. The airport would serve to encourage inter-island flying by small personal and charter planes by providing facilities in an interesting spot for recreational flying. The channel-edge location was consistent with the intention of providing maximum protection for single-engine planes experiencing trouble while making channel crossings. No air carrier use was contemplated for the airport. The airport was approved by the CAA Region IX in the 1947 National Airport Plan. However, the project was given no status by the Territorial government. 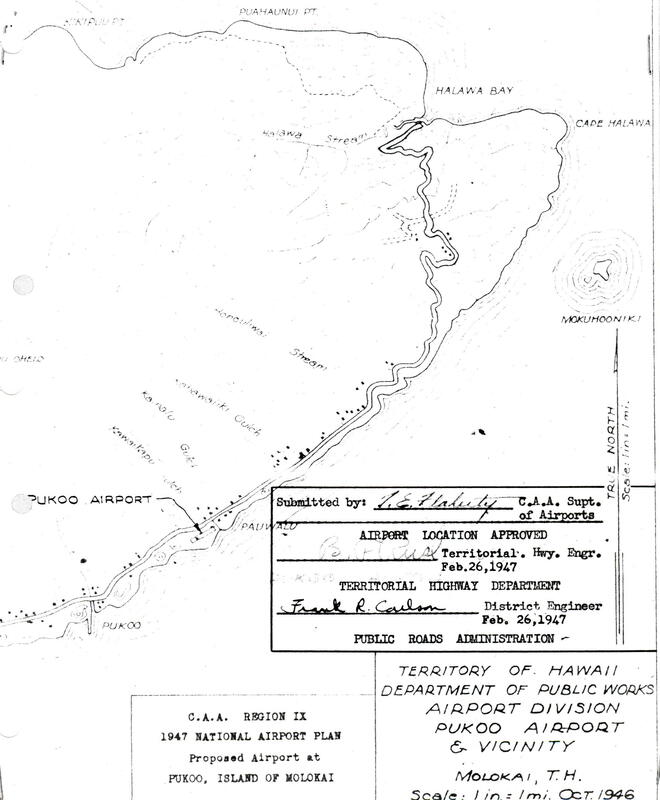 In December 1940, the Territory submitted an application to the CAA under the 1940 National Airport Act for approval of an airport at Kaunakakai which would have been somewhat the same purpose as this project. Funding was never approved for the airport.